SAN DIEGO — California has some of the most expensive gas in the entire country. 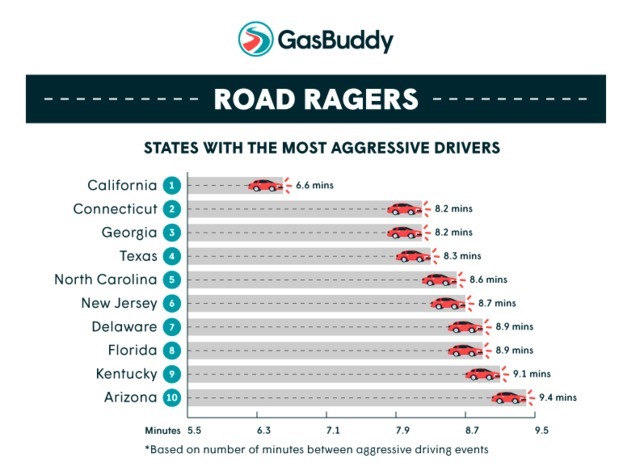 A new study by GasBuddy claims the Golden State also has some of the most aggressive drivers. According to the study, California ranks number one for most aggressive drivers followed by Connecticut and Georgia. The study claims those aggressive habits are also costing Californians cold hard cash. GasBuddy reported aggressive driving habits costs an additional $477 per year in fuel. The habits include hard braking, speeding and rapid acceleration. Further findings indicate that the more heavily populated the city, the more motorists drive aggressively.